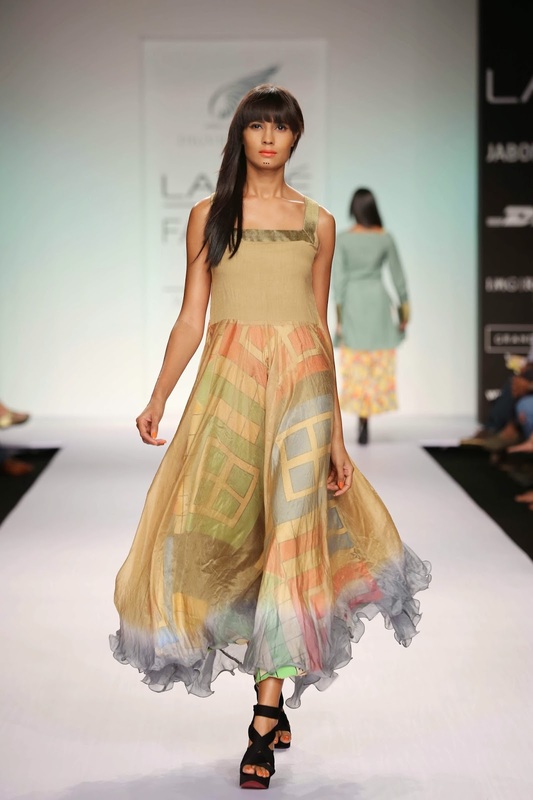 Mumbai, 12th March 2014: “Ludo and Ladders” was the interesting title of Digvijay Singh’s men’s and women’s collection for Lakmé Fashion Week Summer/Resort 2014. Inspired by the childhood games of Ludo as well as Snakes and Ladders, the colours and the motifs of the two games were perfectly reflected on the garments by Digvijay. Using a mix of silk, cotton, viscose blends along with interesting khaatla embroidery from Gujarat, the creations also had digital and block prints. Staying true to the Indo-western fusion silhouettes for both sexes there were shades of red, blue, green and yellow that moved stylishly up and down the easy shapes, while beige, khaki and grey were the basic hues. For women’s wear Digvijay had long layered bias kurtas in crinkle silk with ombré effects. Translucent fabrics over strong prints gave a delicate feminine effect to the flared creations. 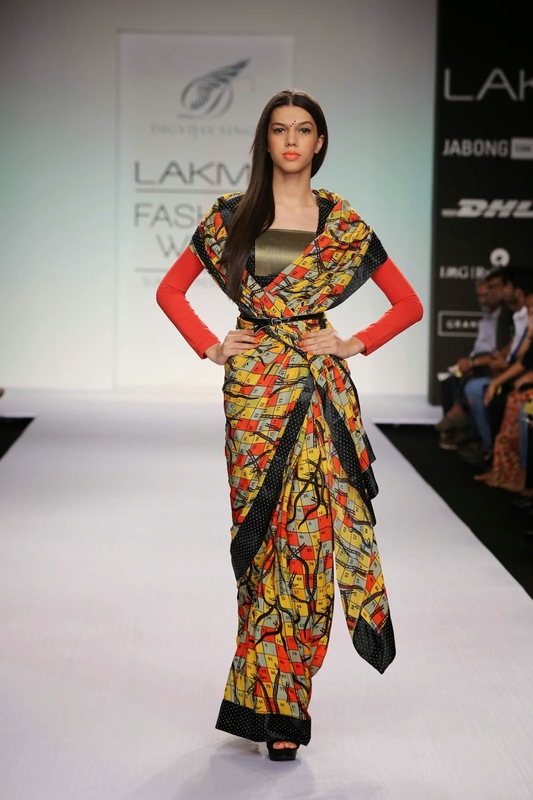 Lean long tubes had long sleeved printed covers, while the saris echoed the prints of the theme worn with long sleeved jersey cholis or fluid kurtas. One of the constant creations was the soft peplum jackets matched with maxis or bias cut tents. Men’s wear remained restrained with a collection of bundies in shades of grey and black prints, a Jodhpuri jacket in beige/brown checks as well as a solitary western jacket thrown in to balance the look. 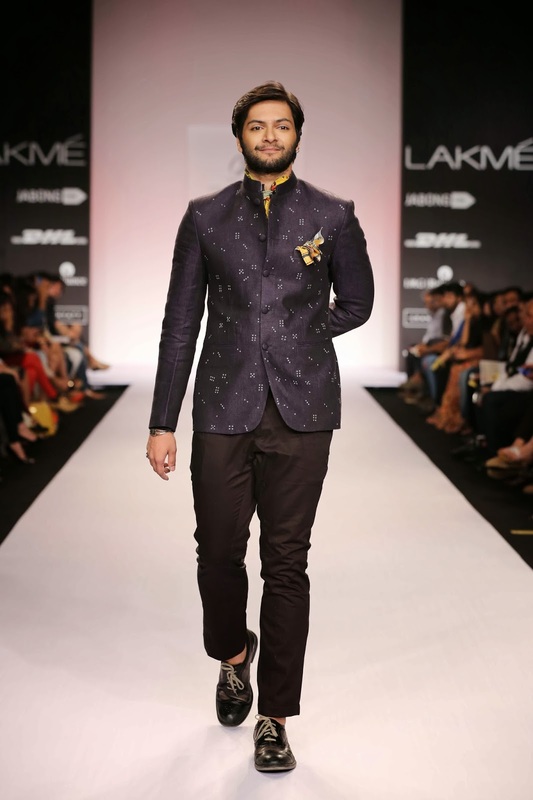 The showstopper was Bollywood’s handsome star Ali Fazal from the movie “Fukrey” in a stylish black Jodhpuri jacket. For a fun filled collection, Digvijay Singh offered a colourful line that will delight the fashion conscious men and women. 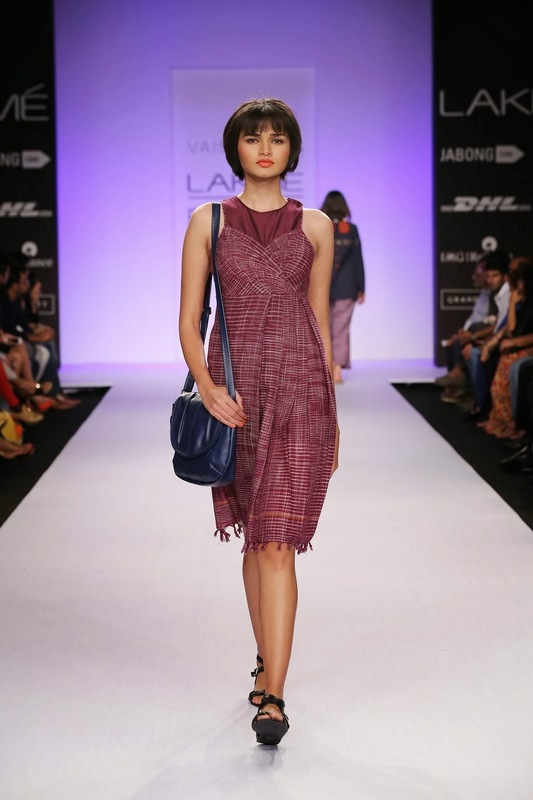 Inspired by the fabulous tribal khadi fabrics created in the hinterlands of Assam by women weavers, Vaishali Shadangule’s collection called “Ravayat” was a compelling stylish offering at Lakmé Fashion Week Summer/Resort 2014. Turning this magnificent natural fabric into western silhouettes, Vaishali’s creations were a mystical blend of motifs woven with wool into the fabric instead of embroidered. Ideal for jackets, short dresses, unconventional drapes and pants, the very natural nature of the textiles was the focal point of the collection. Shades of navy, black and green blended perfectly with ecru, grey and purple to present a soothing collection for summer wear. 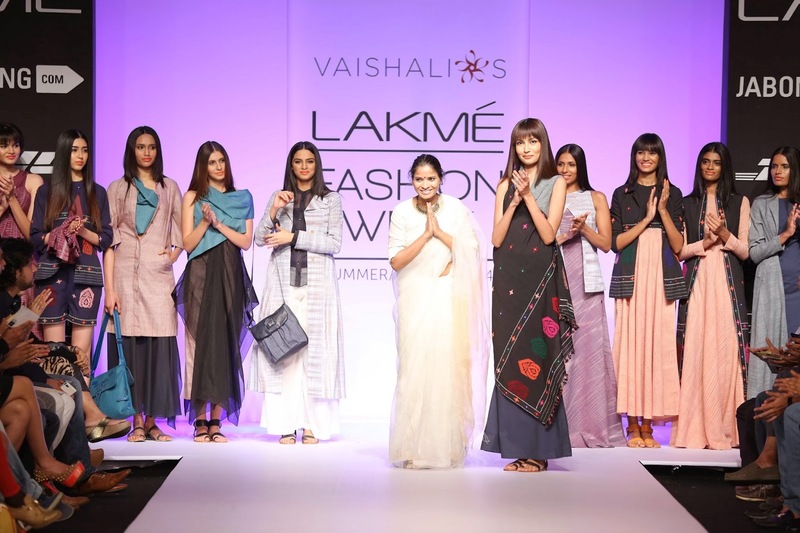 Keeping the natural warp, weft and grain of the lovely weaves intact, Vaishali allowed her creativity to move in unison around the textiles without disturbing its structure. 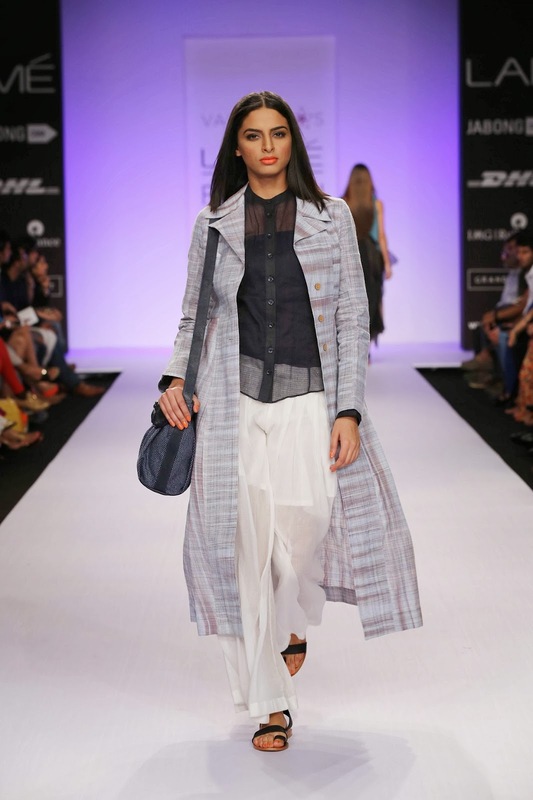 The curved hem side tie-up kurta, cross over asymmetric top, shorts, soft jacket, pleated full pants and draped fitted dress had an enticing beauty as the creations came down the ramp. Wrap handkerchief top over layered matching tunic, floor kissing trench coats, empire line double-breast maxis and flared panelled gowns revealed the glory of the fabric as well as the innovative construction techniques of Vaishali. Keeping the sultry season in mind, Vaishali ensured the ensembles were soft, fluid, flowing with a major thrust towards resort and holiday wear. Go traditional and tribal, declared Vaishali Shadangule with her “Ravayat” collection which was a pleasant fashionable mix of craft and style. Note: Baggit, one of the largest selling bag brands in India and the official handbag partner Lakme Fashion Week 2014 has put together select limited edition collection exclusively for the fashion week with an eclectic mix of vibrant colors and contemporary styles that will add a dose of glamour to your wardrobe this summer!